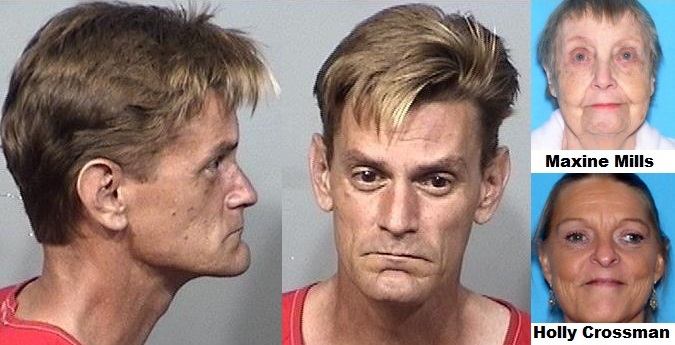 COCOA, Florida - A Brevard County, Florida man has been charged with murdering his grandmother and aunt with a hammer in their home in unincorporated Cocoa, Florida. Just after 12:30 p.m. on Tuesday, Brevard County Sheriff's deputies responded to 4061 Eucalyptus Place after a 9-1-1 call was received from a man who said that he had harmed two people inside the residence. When deputies arrived at the home, they discovered both 84–year-old Maxine Mills and 61-year-old Holly Crossman inside the residence with head wounds that are suspected of being made with a hammer that was found laying across Mills' legs. Deputies identified the man who called 9-1-1 as 41-year-old Marty Connell, who is the grandson of Mills and the nephew of Crossman. Connell had previously lived at the residence with his grandmother but was currently homeless and camping in the area of State Road 528 and Industry Drive in Cocoa. Investigators say that there was a history of domestic violence between Connell and Crossman and that a restraining order was issued against Connell in 2011 that was still in effect. After being interviewed by Homicide Detectives, Connell was arrested and charged with first degree premeditated murder. Connell was booked into the Brevard County Jail where he is being held without bond. Anyone who may have information about this Homicide is asked to please call Agent Wayne Simock of the Brevard County Sheriff’s Office Homicide Unit at 321-633- 8413 or CRIMELINE at 1-800-423-TIPS (8477). All calls to CRIMELINE are confidential and the caller may remain anonymous.